If there’s a platonic ideal of all-ages entertainment, Pixar has hit it on multiple occasions. The animation house’s greatest triumphs, like WALL-E or the Toy Story movies or the recent Inside Out, tend to delight the young and old alike, because they locate a common ground, rather than trying to compartmentalize their pleasures for different members of the family. On the mercenary flip side of this strategy is the Cars franchise. From their goofy wordplay and exaggerated accents to the basic toy-store appeal of their anthropomorphized automobiles, these colorful comic adventures are probably the most consistently juvenile of Pixar’s fantasias. At the same time, Cars was also designed to set off waves of boomer nostalgia—for small-town values, for old-school Americana, for the classic car culture of a bygone era. It’s no mystery, really, why these films are at once insanely profitable and less than critically adored: They’re the only Pixar productions that feel demographically engineered, illustrating the difference between offering “something for everyone” and one special thing for anyone. The best thing that can be said about Cars 3, the studio’s dispiritingly formulaic return to a world of talking jalopies, is that it isn’t another feature-length showcase for the limited comedic stylings of Larry The Cable Guy. To be fair, the much-maligned Cars 2 didn’t put dimwitted tow-truck Mater in the driver’s seat of his own movie just to capitalize on the character’s popularity, or even just to avoid carbon-copying the first film. Pixar also made the sidekick the main attraction because Lightning McQueen, the hotheaded hotshot race car voiced by Owen Wilson, had basically exhausted his capacity for personal growth in the original. Cars 3, which relocates the franchise back to America’s dusty backroads after the globe-trotting spy games of the first sequel, has to find a way to siphon some new dramatic gas out of the character. Its solution is to this time make McQueen the veteran—a relic competing on the increasingly cutthroat faux-NASCAR circuit, now dominated by a new class of whip-fast whippersnappers, using technology to boost their performance. If you wanted to be charitable about it, you could argue that this makes Cars 3 the latest model off the Pixar assembly line to seriously explore mortality and obsolescence. (Can’t you just imagine a broken-down McQueen, tilting toward a fiery landfill apocalypse, like the nearly incinerated playthings of Toy Story 3?) But the script, a six-man group effort led by director Brian Fee (taking over behind the “camera” for car nut and Pixar honcho John Lasseter), filters these key themes through a lot of rusty old sports-movie clichés. This is a sputtering comeback story at heart, albeit one dropped into the middle of the perennially baffling alternate Cars universe. After pushing himself too hard to keep up with arrogant millennial rookie Jackson Storm (Armie Hammer), McQueen suffers a spectacular crash, then lays lows for a season in recovery. Pressured on multiple sides to retire, he instead hooks up with a smarmy new sponsor (Nathan Fillion), whose high-tech training facility emphasizes Moneyball-style metrics—measured on a race simulator—over actual wheels-on-dirt driving. McQueen’s trainer: spunky young number cruncher Cruz Ramirez (Cristela Alonzo), who helps other cars realize the racetrack dreams she gave up on years earlier. Visually, everything is up to Pixar code. The race scenes, parked at the beginning and the end of the movie, exhibit an unprecedented level of textural detail (at times, only the giant windshield peepers and lolling hood tongues remind that you’re not watching real NASCAR footage), while the animators capture the soft dusk glow of the rural heartland so invitingly that Cars 3 may inspire even more road trips than Toys“R”Us shopping sprees. But this also one of Pixar’s clunkiest acts of storytelling, with new characters so blandly forgettable that they make you long for the dopey celebrity-voiced stereotypes of Radiator Springs. (Even Mater only gets a few brief scenes—a blessed demotion for those not taken by his bumbling comic relief.) Since Pixar’s technological wizardry doesn’t (yet) include necromancy, Cars 3 casts Chris Cooper as the wizened mentor junker of the wizened mentor junker Paul Newman voiced in the original, allowing the new film to essentially recycle the first film’s most affecting relationship. Having their oil and burning it too, the filmmakers shake their fists (wheels?) at the arrogance of the young competitors nipping at McQueen’s bumper, while also setting up a “surprise” mantle passing that only the youngest of viewers will fail to see coming around the bend. Cars 3, of course, has been constructed with those youngest viewers in mind, and none of its shortcuts will matter much to a kindergarten-aged target audience. But Pixar doesn’t usually require it’s-a-family-film caveats. 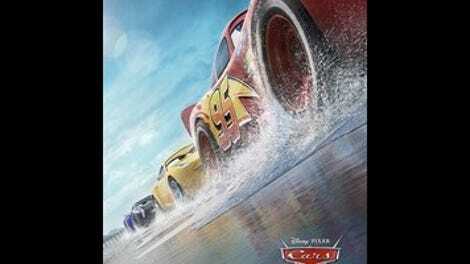 Like its poky ancestor, this is a movie about a sentient race car that remains in talky first gear for most of its overlong running time; antsy kids and their bored accompanying adults may find their minds wandering to the endless contradictions, implications, and unanswered questions of the franchise’s nightmarish dystopian reality. When, for example, McQueen and Ramirez are chased around a backwoods demolition derby by a suped-up school bus (Lea DeLaria), enjoyment of the film’s weirdest detour may take a back seat to wondering what use, exactly, this human-free world could have for a school bus. Otherwise, time can be killed identifying the little meta half-acknowledgements smuggled in by the screenwriters, as when McQueen laments his future as nothing but a famous face to sell merchandise—the real reason, one supposes, that Lasseter and company put him back on the track. “Every time you lose, you damage the brand,” the aging champ is told by his money-grubbing sponsor. 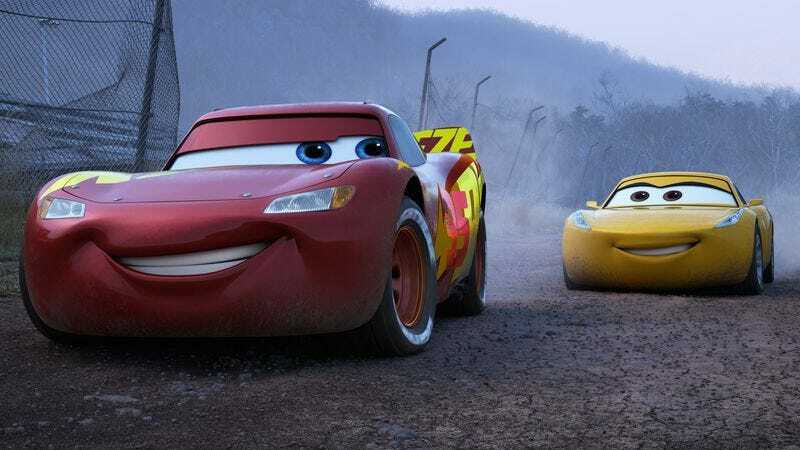 Pixar’s brand can withstand some damage, but there’s no denying that a cornball time-burner of a sequel like Cars 3 counts as a big loss.